Welcome to Ganttech.com! This site is the home of Mr. Jamie Gant’s Technology classes in Miami Dade County Public Schools. 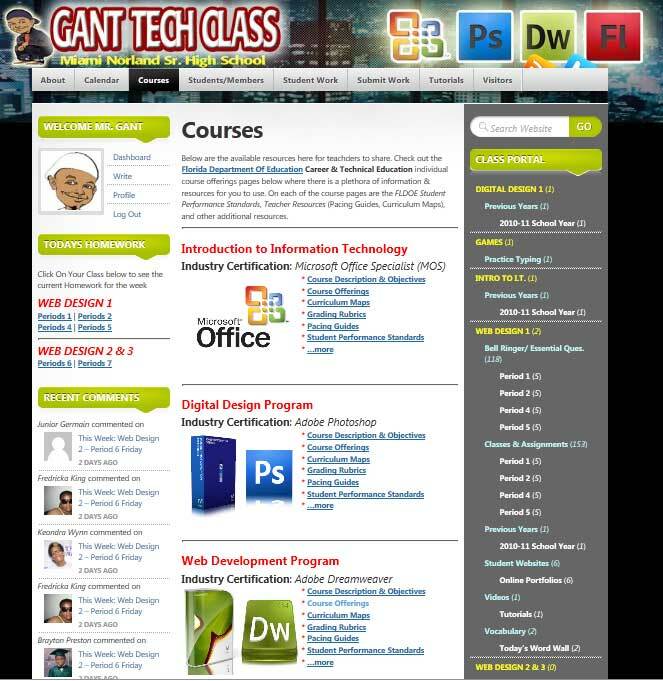 On Ganttech.com, you will find lesson plans, curriculum ideas, student created work including websites, artwork, and more. Click the links below for more info on the site… And feel free to use the contact page to ask a question or suggest a new page here. I’m honestly just not sure what else anyone might want to know about the site! In 2010-2011 School Year, I built this site for my Technology class at Miami Norland Sr. High School during the 2010-2011 Miami-Dade County Public School Year. Apart of the Academy of Information Technology, I wanted an online portfolio for my students that stayed with me from 9th grade through graduation. I continuously added and upgraded the website throughout the 2010-2011 school year as new needs became evident. Ganttech.com became a really valuable resource that allowed me to take my teaching strategies to a new level. During the 2011-2012 school year, my prior years students were excited to see they could still access all their work from the previous year. My Web Design 1 class students during the 1st class logged on to show the students what they created on my website. Each student that takes my Web Design course I provided with an actual web presence on Ganttech.com to hold all the websites they created. What has started out as a online portfolio for my students has become so much more and changed the way I teach Introduction to Information Technology (Microsoft Office), Digital Design(Photoshop), Web Design (Dreamweaver), and Programming (Flash), AP Computer Science (Java, Game & App Design (Android & Apple Mobile Development). In 2013-14, I updated the site to a course template that anyone could subsribe to a course that I have taught. This online course offerings will allow others to go at their own pace to learn the various classes that I teach. Login using you Google account below by clicking the logo Google logo below. Mr. Gant from your home now! Learn anything with Lynda.com. Use your Miami Dade County Library Card and it gives you FREE access to Lynda.com ($30/month value). Sign in now to Start learning how to code, video edit, anything you ever wanted to learn.